Hello! Happy Monday! That means it's time for a new Mojo Monday sketch (#277). This one is brought to us by Carole. I flipped the sketch and made another 6" x 4" card for my Project Life album. This sketch had me stumped at first, then once I flipped it, I was able to come up with my card. I left room on the right hand side to add a photo of Sabrina, which I will do before adding it to one of my Project Life spreads. This sentiment from Starstruck will be perfect! Accessories: Polka Dot Basics II Impression Plate (PTI), 1/4" Round-it-all (Zutter), Wood veneer butterfly (Studio Calico), Rhinestones (Kaisercraft), Foam tape, Thread, Sewing machine. Love the simplicity of your card and the happy little verse! I hear you re being stumped LOL! 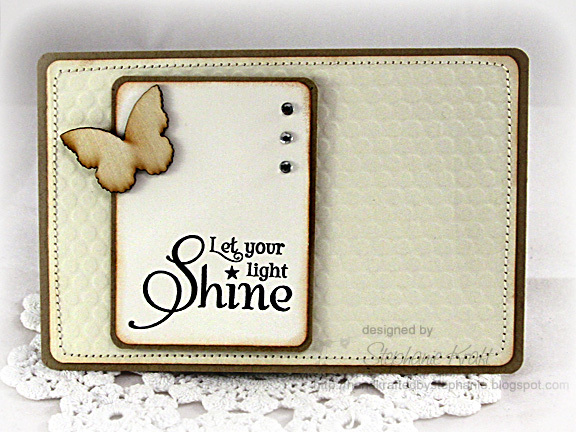 YOU have made a fabulous card - love the butterfly and the embossed panel. This is a beautiful piece! I love the stitching aroun the edges. Love the clean design and textured BG! I'm off to check out your Project Life pages after seeing so many wonderful title cards! So very creative. You just "flipped" it....how come that doesn't work for me? Love it! Pretty card Stephanie! Love the wooden butterfly and textured background!